Landmark and one of the most amazing tourist attractions of Kiev. Andriyivskyi uzviz (descent). View from Andriivska church. 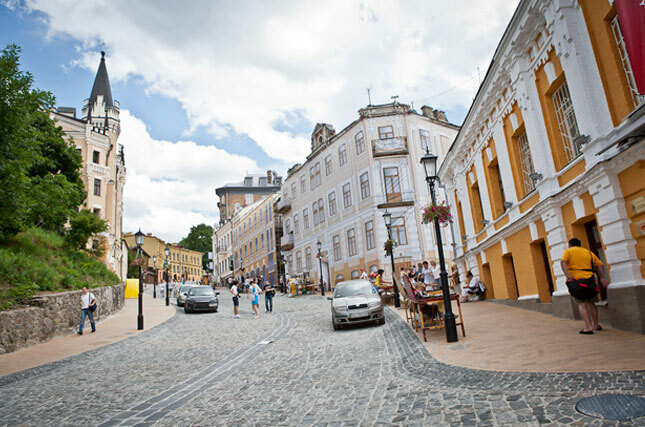 Small square on the beginning of Andriivsky descent..
Also called the Montmartre of Kiev. 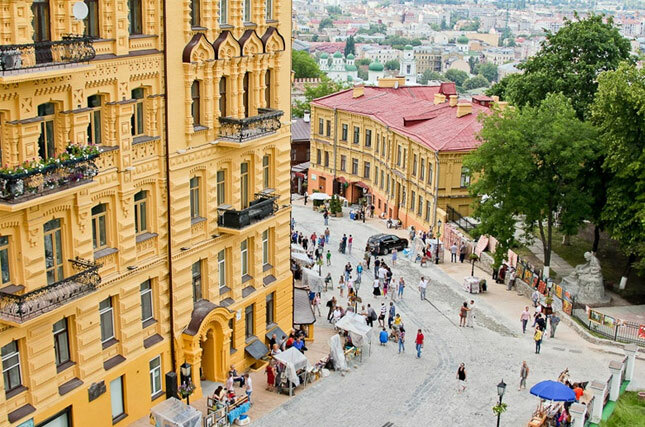 Andriyivskyy Descent, also called the Montmartre of Kiev, is a historic sight and one of the most amazing tourist attractions of Ukraine. 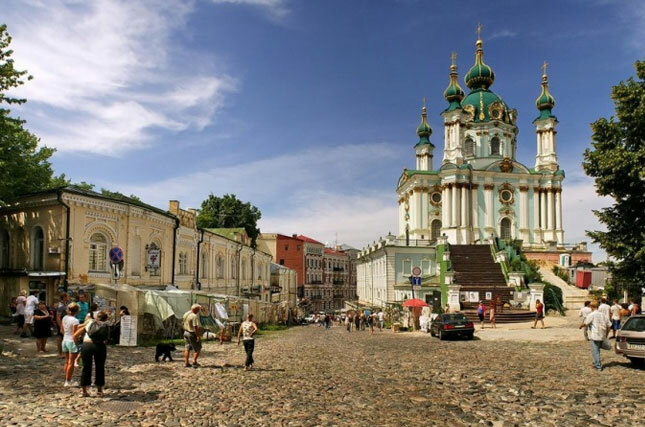 The Andriyivskyy Descent begins on the highest point of the old Kiev Mountain (Starokyivska Hora) not far from Mykhailivsky Golden-Domed Monastery and Saint Sophia cathedral. The street descends to the Podil district and ends at the Kontraktova Square. It’s close to the St. Andrews Church and this is where this descent got its name from. This street contains rounded rocks and it’s around 720m in length. It offers many amazing structures along with its rich history, impressive architecture and rare topology. It has a few art galleries and several gift shops as well. 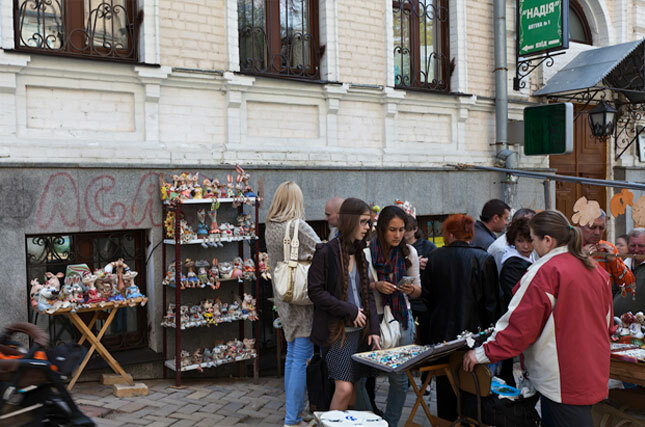 This street is famous for holding several festivals, such as various art festivals and the Kiev Day celebrations in the month of May. There are many legends about this descent. According to one of the legends, Andrew the Apostle visited the hill, where the descent begins, and predicted that a great Christian city would be founded. Right after that, wooden churches began to appear in the nearby areas and fulfilled his prophecy. Another legend states that where the Dnieper River is now, another sea used to flow there instead. When Saint Andrew visited the mountains, he erected a cross exactly where Saint Andrew’s Church stands today and the sea just disappeared. However, a small portion of the sea still flows under the mountain where Kiev is located. The church was built without any bells, because the legend says that when the first bell strikes, the water might appear again and flood the left bank of Kiev. Saint Andrew’s Church is a great attraction of the descent. It was constructed on top of a hill, where the descent begins. It overlooks the Podil neighborhood. Tsaress Elizabeth Petrovna, the Empress of Russia, proposed to build this church when she came to Kiev in 1747-1754. She laid the foundation of the church. It was designed by the imperial architect Bartolomeo Rastrelli who was a Russian architect. The One Street Museum is another famous sight that you don’t want to miss. It exhibits more than 6500 artifacts and you will be able find many of the historic items of the descent in the One Street Museum. You will be able to find detailed information about the Saint Andrew’s Church and the various other historical buildings that are located on the descent. This museum proudly presents a huge collection of antique books as well. Mikhail Bulgakov's house is another great attraction of this descent. Mikhail Bulgakov was a renowned Kiev-born Russian writer. His family owned different houses on the street in the beginning of the 20th century. In his novel, The White Guard, he brilliantly illustrates the street and house during Russia’s chaotic revolution in 1917. No.13 Andriyivskyy Descent was the address of the house that is still known as the Bulgakov's house. There is a plague that clearly displays the address. This structure was preserved and on May 15, 1991, a museum was opened inside the building. The Andriyivskyi Descent is a great sight to explore. It is loved and admired by both Kievans and tourists. Its rich history and exceptional structures will undoubtedly keep you fascinated for hours. Our apartment near Andriyvskyi Descent - 22 Mykhailivska street apartment. It is about 3-4 minutes walking to descent.